In terms of human development potential, Morocco is a nation of immense promise. It is where gifted fortunes of nature (including agricultural) come together with dynamic social development Frameworks that could launch the country into a bottom-up haven in Africa and the Near East of community-managed projects and change. Sadly, however, for the majority of people, the application of the country’s combined initiatives for development is not seeming consequential. The problem is that Morocco’s programs for national growth and development through people’s participation are not being orchestrated together. Integrating these programs would enable their mutual reinforcement to promote accelerated growth and success of development initiatives. Commenting on the calls in Morocco, publicly by King Mohammed VI, that the nation must now reconsider its development model: I submit that it is specifically the model to implement the nation’s development model that requires the major reevaluation and overhaul. How can the three Frameworks better fulfill their individual purposes, and how can they relate with each other to create human development that is sustained by the local beneficiaries? The first Framework, the Municipal Charter, requires locally elected representatives to assist participatory community planning in the determination of projects. This could and should be a major pathway for sustainable development to take hold, due to the fact that people’s participation (along with finance) is the key factor of sustainability. Further, people-driven projects, instituted in the Municipal Charter, are necessary for sustainable development and actualization of the other Frameworks that compose the Moroccan model. However, in Morocco there is a constant challenge: elected members to municipal councils are typically not trained in facilitating participatory methods. Catalyzing widespread, inclusive development projects, means first implementing experiential training programs for university students, school teachers, technicians, civil society members, elected officials, and local people, for example, to be active agents of participatory development. Through training-by-doing, the aforementioned municipal development plans can then reflect the actual will of the people in regards to the projects and future they most want. The second Framework, Morocco’s National Initiative for Human Development, is a national fund for infrastructure projects, capacity-building, social and cultural revitalization, and job generating activities on sub-national levels. This fund should include a multi-billion-dollar budget over five years for participatory planning training and community-identified projects. The NIHD should primarily help actualize the development projects designed according to the Municipal Charter. Indeed, the NIHD and the Municipal Charter can only be successful if they work in tandem. NIHD should help fund the participatory development plans embodied in the Charter, and finance projects that local people expressed they most need and want to implement. Third, the “Roadmap” of Moroccan decentralization--taken from the public statements of the King of Morocco since 2008--aims to utilize ongoing national level engagement (devolution) along with sub-national partnerships (deconcentration), to help implement community projects (delegation). In other words, the Moroccan pathway aims to rally national resources and partnerships for local development, which in principle is good for the sake of sustainability. Without the Municipal Charter and the NIHD working together, however, adequate decentralized arrangements of public administrations will not be enduring. Overall in Morocco, decentralization is not significantly taking hold, which further adds to the suppression of new local development. The national level still generally decides the parameters, terms, cases, and situations for sub-regional actions. As far as destabilizing political outcomes that may be a concern and caused by decentralization, as described in international cases, the following seems clear in regards to the Moroccan case, certainly based on my experience: the entire emphasis of people during community-based discussions centers on livelihoods and meeting immediate human needs. I have observed no basis for concerns that stem beyond these developmental factors. Understandably, executing decentralization, particularly in regards to its pace, is a delicate process. The local level is stratified socio-economically, environmentally, and in regards to gender just as it is on the societal level and globally. Advancing decentralization quickly can be fraught with unhelpful consequences, such as entrenching further the locally affluent and political classes. However, genuine implementation of the Municipal Charter in close conjunction with the NIHD could create the needed participatory democratic conditions which would enable Morocco to eventually opt for an emerging form of communalization--or decentralized management to the municipal level. The Moroccan Frameworks for development bear essentially what are needed in order for sustainable development for marginalized areas and groups to be catalyzed with enduring results. The Municipal Charter could provide the plans for projects that the NIHD may then help accomplish. Decentralized arrangements are subsequently built in that wake of community project implementation that involves multi-sectoral partnership. Moroccan agriculture, with its enormous income-generating and environmental-enhancing potential, can and should be the engine for self-reliant financing of the people’s projects. Agriculture projects may also become identified and determined through the process of implementing the mandates of the Municipal Charter. It is not the insufficiency of these Frameworks that accounts for the hardships that afflict Moroccan people, especially in rural areas. It is their inadequate implementation stemming from a considerable lack of their popular understanding and the skills that are needed in order to translate them into reality. I have found that all that is needed is to give men and women of all ages the chance to come together for community workshops that if followed through can ultimately deliver the projects that they and their families have hoped for far too long. Dr. Yossef Ben-Meir (yossef@highatlasfoundation.org) is a sociologist and president of the High Atlas Foundation, a nonprofit organization dedicated to sustainable development in Morocco. 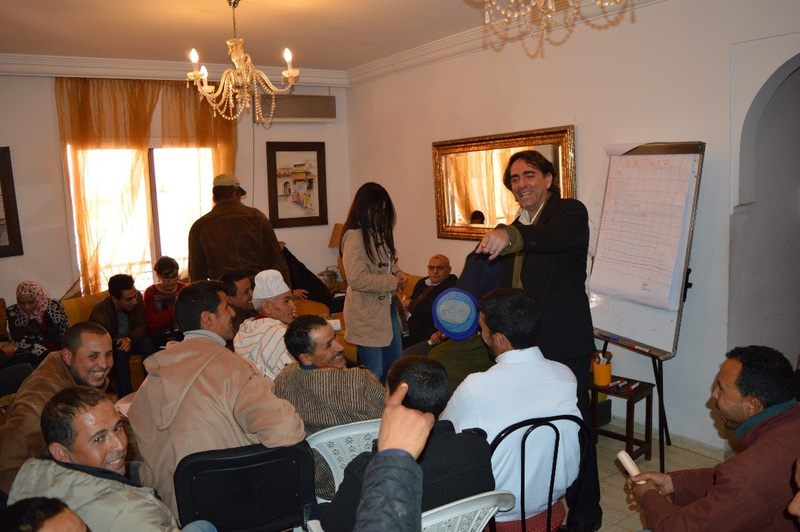 A project planning meeting in Marrakech, with visiting community representatives from the nearby Al Haouz province (Photo by the High Atlas Foundation, 2018).